His Excellency Rochas Okorocha, Imo State Governor. 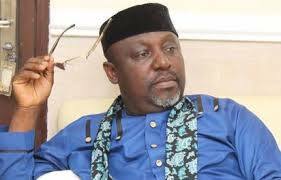 BAF MEDIA gathered that there were reports that Okorocha had left the party for the Action Alliance (AA). However, in a statement, Okorocha’s aide noted that there has been“an amusing tale that has been trending on the social media for days now. “Now our response to the unfounded story; Imo people do not support stolen tickets and that is why all those who stole the guber tickets of their parties for the 2019 election cannot fly. According to the statement, “Rochas Okorocha does not play hide and seek game. He has assured that President Muhammadu Buhari would win overwhelmingly in the State and all the APC marketable Candidates, because you cannot force Imo people to vote for someone they know cannot govern them. “Finally, Rochas Okorocha“full-ground” in APC. And he is working hard for the success of the party in the elections. “Those entertaining serious fear are those with strange tickets. And they do not blame anybody but themselves.